Hello, friends. You may have noticed the dripping condescension in my introduction: This is my way of noting that I am not Lawrence Dai. Your faithful blogger, I am sure, is watching the movie today, but he couldn’t possibly find a moment to fart out the Gerber-caliber slop you’ve become so used to at 11:45 p.m. CDT. He tells me he’s on a date--no, wait, writing a paper, about his brother’s wedding or some such thing--so I’ve stepped in. My name is Jack Dickey, and I write about sports for Deadspin. I’m on Twitter, too. Anyway, Lawrence told me I should write about sports, because you guys love sports almost as much as you love julienned onions and clarified butter, and, I suppose, this wretched movie. 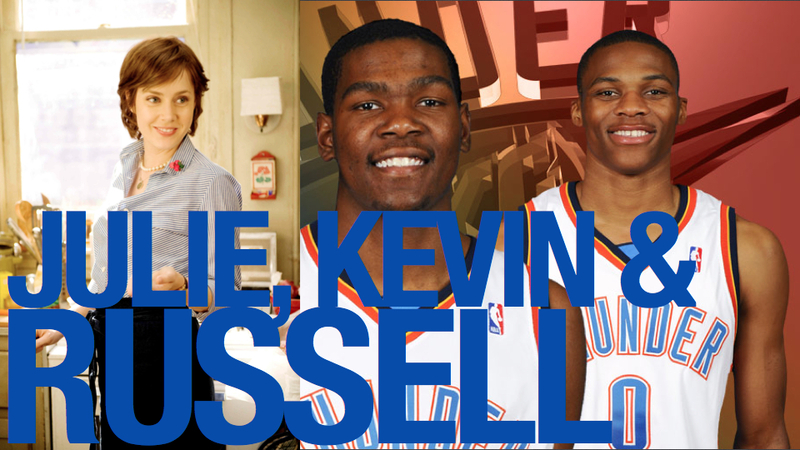 But it’s all the same: Russell Westbrook is the Julie Powell of sports. I’ve only seen Julie and Julia once, and that was enough for me. It’s a slapdash, schmaltzy film with one decent performance in it. Never mind, of course, that you can catch hours of Meryl Streep’s excellence in other films and Julia Child’s squawking authority on your local PBS affiliate. The sexual chemistry on Cooking at Home With Julia and Jacques (which you can watch on Hulu, too) tickles so much that you can put your Tucci cardboard cutouts in storage. But I wouldn’t say the movie disappointed me--if only because I was never appointed in the first place. You can’t go into a Nancy Meyers Nora Ephron movie and expect anything besides the fake female empowerment that J+J eventually gave us. But if I am expected to write about sports, I have to explain that the semifinal round of the NBA, particularly the series between the Dallas Mavericks and the Oklahoma City Thunder, drowned me in the unmistakable sour milk of letdown. Dallas dispatched OKC in five easy games, and the Thunder squandered comfortable leads in the last two. Which sucked. I--as have many others over the past few weeks, and months--became a little bit of a Thunder fan, despite the team’s terrible name, despite its location, despite the way its owners hijacked it from the suffering fans of Seattle. We fell in love mostly because of OKC’s two young stars, Kevin Durant and Russell Westbrook. Durant is easy to admire: He has the game of any sharpshooting two-guard, except he’s 6’ 9” and plays small forward, usually. This season was his fourth in the NBA--he’s only 22 years old--and his second leading the league in scoring. Plus, he wears a backpack to press conferences and shootarounds. Seemingly nobody wears a backpack after leaving college, and yet. KD will wow us for a long while. But our emotions get murkier when we think about Westbrook. He’s a point guard, a couple months younger than Durant and a season less experienced. He does plenty of things well: he drives and rebounds better than most any point guard playing today (save Derrick Rose), and he scores commensurate with that: a lot. But he’s not the pretty, perpetually lethal scorer that KD is. No, Westbrook’s shorter than Durant and his jumper is too. And when you watch him play, you cannot understand why he ever pulls up for a jumper. It’s not as though he’s running around, and coming off screens like KD. He always has the ball—when he pulls up and shoots it, it represents a conscious decision on Westbrook’s behalf. The best play, he figures, is if I take a shot. Not a particularly good one, not a necessarily uncontested one, not a close one, but any shot. It’s the path of least resistance, and it vexes the fan so, when he can see just how well Westbrook does everything else. Westbrook shot a troubling 39.4 percent from the field in the playoffs, and did so while taking a ton of shots--20 per game, just as many as Durant had, and in fewer minutes. Folks tend to superimpose morality onto sports, basketball even more so than others, so when I call Westbroook selfish and short-sighted, I mean only to refer to the way he plays ball. And he’s two years older than I am, and, well, I couldn’t run an NBA playoff offense. He’ll get better. But again, ye gods, what a selfish human drain on my wallet. And it’s weird, you know, how the most vociferous defender of Westbrook’s disappointing play is Kevin Durant, who said that those attacking Westbrook should recognize that he, and his game, got OKC to the NBA semifinals. Durant would seem to be the one most harmed by Westbrook’s play, yet he won’t let the media pick on Russell. Part of this is the code of team sports, to be sure, but another part of it comes from outsiders’ inability to understand the mental strain involved in basketball, more specifically: choosing whether to shoot or pass, on such a stage. I just might be wrong about Russell Westbrook, and I’m even more amenable to that possibility if Kevin Durant tells me it’s the case. The diluted version of this confusion might be the way we (men) perceive Julie Powell. Any of you think she’s great, strong, whatever? Probably not. Maybe this movie’s just stupid. Jack Dickey will be on the Memorial Day shift at Deadspin. Come say hello. Email him here. Julie & Julia Quote of the Day: "I am an 'A' student." Today is Meryl Streep Day (yes, she has her day since 2004, and it is on May 27th) and you write about sports and it isn't even Lawrence who is writing it?? That is just WRONG! No F-bomb? Not once? Travesty. Oh Lawrence... How I miss you. But the deeper gendered implications make me uncomfortable: after all, what's Julie doing but showing that she can follow directions really well? It's not only cooking that puts her in the traditional feminine role here, but the submissiveness inherent in slavishly following not only a recipe but an entire book. So here's my question: is cooking inherently not enough of an accomplishment, or is it just the WAY Julie cooks that gives you--and other men, maybe--pause? Are Wylie Dufresne and Ferran Adria (and, yes, female chefs, too--April Bloomfield comes to mind) more like Vin Diesel than Julie Powell is? Vin Diesel is obviously a silly comparison, but is cooking a kind of art, and if so, does Julie exercise enough creativity/ingenuity/etc. to count as an artist? Is it really the accomplishment, the end product, that's flawed here? Is Julia Child a strong female character for male viewers? I like this blog, but what I like best are seeing what she does with leftovers--how she combines components to make new dishes that are less flashy and precise than the originals. We see Julie trying to compensate for things that didn't work out, but--as far as I remember, and I haven't seen the movie since it came out--we don't get the sense that she's the kind of cook who could take the 5 random ingredients you have on hand and turn them into something amazing (unless I'm just forgetting that scene?). There's also the baking scenes in Bridesmaids: the failed bakery Kristen Wiig's character owns; the beautiful cupcake she makes for herself, then stuffs her face with; the well-intentioned but kind of icky scene where the cop with whom she's gone on a date tells her to bake something; the scene where, as part of climbing out of her funk, she makes a beautiful cake. I've talked to a couple female friends about this running theme, and some are uncomfortable by how, well, traditional it is--taking comfort in baking. But baking DOES often provide comfort. There's a catch-22 of a strong woman who gathers strength from traditional female pursuits. Does she become less strong as a result? Or is there a kind of reclaiming that can take place? Today is Meryl Streep Day, so you should definitely make your post for today about that! I feel really ashamed that I just graduated high school and yet I had to look up the definition to at least 3 of the words you used, but I think for a stand-in writer you did really well. I thought your analysis was fresh and your analogies, while sometimes rather distant, where creative and fun.